Sleep apnea is a sleep disorder in which breathing stops and starts repeatedly throughout a night's rest. Women may not realize that they suffer from the disorder until excessive daytime sleepiness lead them in search of the root cause, which can be verified through apnea tests. Menopausal women should keep in mind that the cause could be hormonal imbalance. Continue reading to learn about two main sleep apnea tests, home apnea tests and polysomnograms, that can finally help get you on the right track to having a good night's sleep day in and day out. Candidates for a sleep apnea test at home are those who do not have other sleep or medical disorders - such as pulmonary or neuromuscular diseases as well as congestive heart failure - and are not at risk of having obstructive sleep apnea. Before using a sleep apnea home test, sleep center staff at your physician's office will educate you on how to hook up the testing equipment yourself and explain the procedures. These devices measure breathing and blood oxygen levels while sleeping, and they may also track heart rate and other critical information necessary for a proper diagnosis. This option appeals to many as they are able to sleep within their own living quarters. After the test, you will be instructed to mail or bring the device back into the sleep center, where your sleep apnea test results will be interpreted for your follow-up appointment. 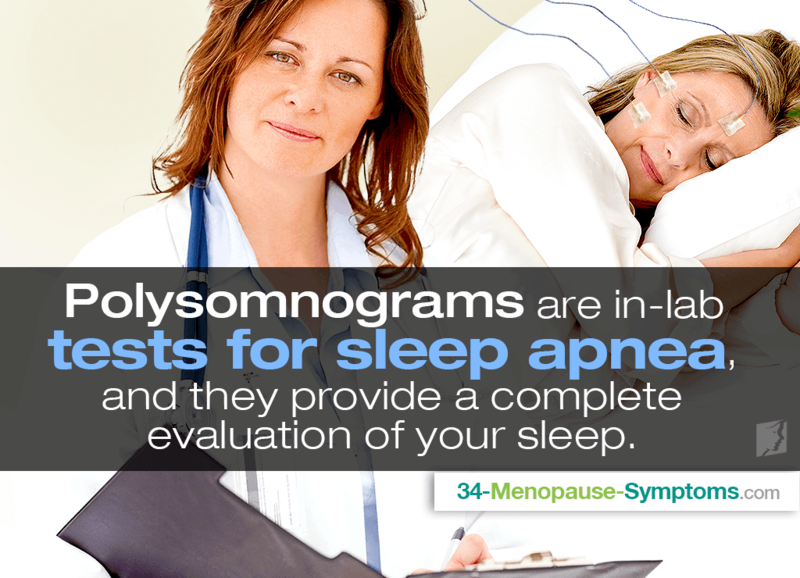 Polysomnograms are in-lab tests for sleep apnea, and they provide a sleep physician with the most complete evaluation of your sleep. Candidates for in-lab sleep apnea tests are women with more complex cases, which include those suffering from parasomnias - unwanted events or experiences that occur when falling asleep, sleeping, or awakening - or narcolepsy. Polysomnograms are also recommended for those who receive continuous positive airway pressure (CPAP) therapy for sleep-related breathing disorders or other treatments that are not working. During these in-lab studies, the patient's brain waves, heartbeats, breathing, oxygen in the blood, air movement in lungs, and eye and limb movements will be charted for accurate diagnosis and treatment planning. In sum, sleep apnea does not have to run rampant in your life, causing tiresome days and unrestful nights for months on end. Home sleep apnea tests that can performed in the comfort of your home can assist in getting you on the track toward very much needed beauty sleep by tracking breathing, blood oxygen levels, and heart rate. On the other hand, polysomnograms, or in-lap overnight sleep apnea tests, are recommended for those who need a complete evaluation of their sleep; they include the ability to chart eye and limb movements as well and are used by those whose treatment is failing them. Moreover, for menopausal women whose sleep problems may be caused or exacerbated by the hormonal imbalance taking place in their bodies as they transition out of their fertile years, various treatments for sleep disorders are available to bring peaceful nights. If your sleep pattern has been disrupted for days, months, or years, you may be experiencing a sleep disorder. Find out which of these are common. If you think you’re suffering from a sleep disorder, the first step is to be diagnosed. Learn about the sleep disorder tests.